This Beautifull Antique Victorian window is still in its original frame. The frame is in excellent condition. The glass has no chips or scratches and the leading is good. THE CENTREPIECE BEING FABULOUS CRYSTAL RED GLOW GLASS. 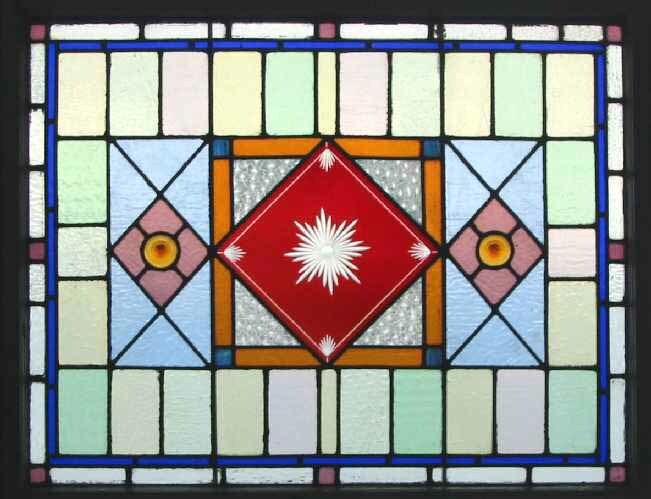 The depth of colour in glass used in this widow has been obtained using methods which are no longer allowed Consequently glass as beautifull as this may never be made again. This is a beatifull piece for any home. Of English origin from around the 1890 mark. Frame 41"w x 36"H (Icluding sah feet of 3" which can be removed) Glass 38 1/2" x 29 1/2" Shipping and packing for this window.USA $199 Will ship internationaly.You can buy this now using the paypal link below the photograph or e-mail sales click here to arrange payment by personal check ,money order or bank transfer.